BYUphoria: noun \BYUˈfɔr i ə\ : a state of intense happiness and confidence in Cougar football; a feeling of happiness, confidence, or well-being, sometimes exaggerated in pathological states as Cougarmania. I have experienced BYUphoria just a handful of times since I started following the Cougars. The definition is fine, but experiencing it is the only true way to understand it. It’s a feeling that makes everything that’s wrong with the world seem okay. And it’s stupid that a sports team can have so much power over you, like BYU has over me, but there it is. There are times when BYU football rips your heart out, and at times there are excruciatingly long periods of incredible frustration and embarrassment. But every now and then, your fandom is rewarded with BYUphoria. It happened this week thanks to the one and only Taysom Hill. Certainly he was aided by other players and coaches, but I’m going to say that without Hill under center, I would not be feeling the way I am right now. 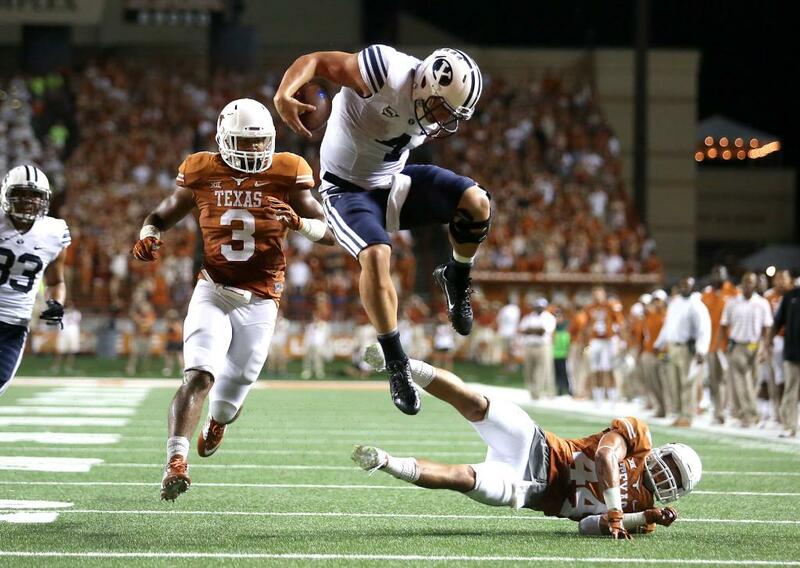 Taysom led the trouncing of Texas for the second straight year, as the Cougars easily defeated the Longhorns 41-7. Coming out of halftime with a 6-0 lead reminded me of 2011, when the Cougars last faced Texas in Austin. Having settled for two early field goals, the Cougars ended up losing 17-16 despite having a lead at halftime. And this game was shaping up to have the same script. But this year, coming out of halftime, the BYU coaching staff made incredibly effective adjustments after halftime, and beginning with this play (which I am still watching), the Cougars never looked back, cruising to an easy 28 points in just the third quarter. And then, the BYUphoria was setting in. I put “EVERYTHING IS AWESOME” on repeat for this entire week, and I have watched “The Hurdle” gif without ceasing. The feeling is amazing; enough so that I might be content if I could never watch another BYU game, so long as I could keep watching BYU-Texas on repeat. We play Houston tomorrow, and while I’m sure that the coaches and players have been working hard to prepare for the game on this short week, I have been relishing in the moment of another great win for BYU football. What games have caused you to experience BYUphoria? Share yours below.